Religious Affiliation and Who’s the mom? When I examined the original parish register at the Bury St Edmunds branch of Suffolk Record Office, back in 2002, the name of this bride’s father stood out. 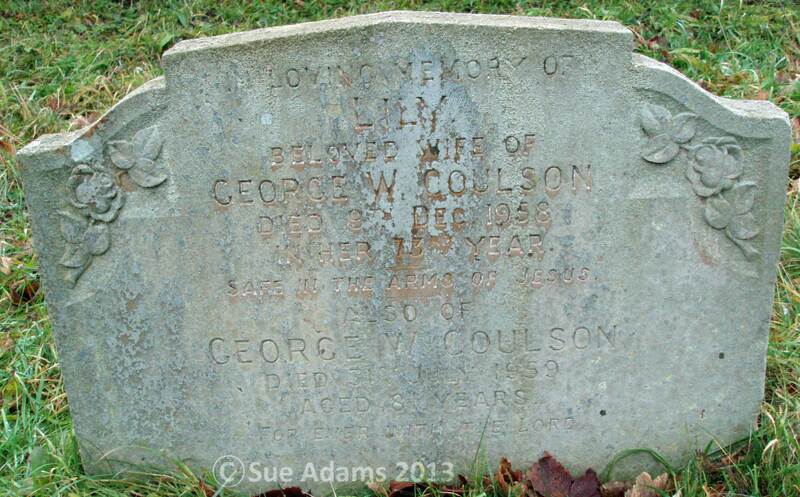 As I was following my Coulson relatives, I did not investigate further at the time. Alice Jane Smith does not sound like a man’s name, so why would a woman be recorded as a ‘father’? Could Lily May have been the illegitimate daughter of Alice Jane Smith? My first step in pursuing this question was to verify the marriage entry from an independent source. A gravestone at the Wattisham Strict Baptist chapel commemorates this couple and confirms their approximate dates of birth. The Baptist chapel at Cross Green in Hitcham was a satellite of the Wattisham chapel. In my experience, people who are missing from the established Church of England registers for All Saints, Hitcham, often turn up in the Baptist records. George was baptised at All Saints. The couple could have married in the Baptist chapel at this date. As there is a long history of non-conformists marrying in the established Church of England, we can’t assume that this couple’s choice indicates their religious affiliation. George and Lily appear on the 1911 census at Brettenham Road, Hitcham, with daughter, Violet; brother-in-law, William Smith, aged 61; and mother-in-law, Susannah Smith, a widow aged 72. The mother-in-law relationship to George suggests Susannah was Lily’s mother, but her age is too old for that to be likely. I found no reasonable match for Alice Jane Smith, which is consistent with her deceased status on the 1905 marriage register. In 1901, Lily was living and working as a servant in the household of a farmer in neighbouring Bildeston, so we can glean no helpful relationships from that record. Susannah (aged 65) is recorded on the Hitcham census with husband Robert Smith (aged 79) and two adult un-married daughters, Alice (aged 35) and Elizabeth (aged 21). The 1891 Hitcham census is even more helpful as Robert Smith’s household contained wife Susan (aged 50), daughter Alice (aged 23) and granddaughter Lily M (aged 5). It does not identify Alice as Lily’s mother, but I will be surprised if the civil birth registration for Lily (1886, Jan-Mar quarter Cosford district, vol. 4a, p. 691) does not confirm my suspicions. The evidence so far clearly suggests Lily May was raised with the support of her grandparents, Robert and Susannah Smith.